This is one of my favorite variety rice. During this winter season, kids get sick very often and I made this rice yesterday for my girls. They have seasonal cold/sore throat. Luckily they liked it. It takes just few minutes to make this rice, if you have cooked white rice. Here goes the recipe. Take a small pan, dry roast whole pepper and cumin till a nice aroma comes. Let it cool. Grind it coarsely adding required amount of salt. In the mean time, spread the cooked rice in a wide plate and add the melted ghee to it. 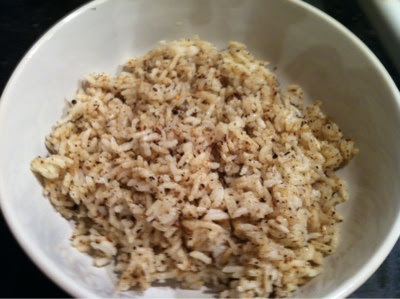 Now take the ground pepper/cumin/salt powder to the rice and mix it nicely without mashing the rice. You should be able to see the rice grains separately. Serve it hot with sutta appalam. Since my daughter had sore throat, I did not give this rice to them with potato chips. inviting dear..Join me in Fast Food - Poha event in my blog. My favourite rice, love with fried papads. Nice receipe.. Gonna try it..